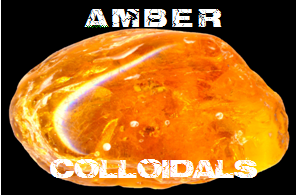 These Amber Colloidals are made like the rest of my colloidals with low voltage DC electrolysis. Famous Hippocrates (460-377 BC), father of medicine, in his works described medicinal properties and methods of application of Baltic amber that were later used by scientists until the Middle Ages. In ancient Rome Baltic amber was used as medicine and as a protection against different diseases. Calistratus famous physician of those times, wrote that amber protects from madness, powder of amber mixed with honey cures throat, ear and eye diseases and taken with water cures stomach illnesses. Pliny the Younger noted that Roman peasant women wore amber medallions not only as adornments, but also as a remedy for "swollen glands and sore throat and palate." Persian scientist Ibn Sina (Avicenna) called amber remedy for many diseases. There was a belief in eastern countries that amber smoke strengthens human spirit and gives courage. Historically, treatments for healing and pain relief were made only from the natural environment such as minerals, plants, berries and animals. The common belief was that the more ingredients in a medicine, the stronger the medicine became and the more powerful the results. Interesting to note that Nicolaus Copernicus documented that his formulas for medicine included 22 specific ingredients --- and one of them was Baltic amber. What is it that amber possesses that has made it a unique contributor to health since the beginning of recorded time? It’s simple, actually. It has a substance – or ingredient – called Succinic Acid. A powerful anti oxidant that helps fight toxic free radicals and disruptions of the cardiac rhythm, Succinic Acid has been shown to stimulate neural system recovery and bolster the immune system, and help compensate for energy drain in the body and brain, boosting awareness, concentration and reflexes, and reducing stress. Baltic Amber contains 3-8% of Succinic Acid, a scientifically examined medical substance used in contemporary medicine. The highest content of the acid is found in the amber cortex--the external layer of the stone. There is much documentation regarding the power of Succinic Acid. Albert The Great, born in 1193 who later became a Dominican monk, called Natural Baltic Amber “Succinium” and stated that it was the most effective medicine of the time followed by other substances such as ocastoreum, mors, camphor, tartarus, and aurum. People of that time also made amber tinctures from beer, wine and water and declared them effective against everything from stomach aches to rheumatism. Recent scientific research has also proved that succinic acid has a very positive influence on the human organism. It strengthens the body, improves immunity, the course of energy-related processes and the balance of acids. Succinic acid was analyzed by the pioneer of modern bacteriology, the Nobel Prize winner,Robert Kock (1886), who confirmed its positive influence and discovered that there is no risk of the accumulation of surplus amounts of Succinic Acid in the human organism, even after the introduction of considerable amounts into the body. Amber’s importance as a talisman is not based on crystalline structure, as it is amorphous, nor on its chemical composition, as it is not a mineral. Rather it is the organic essence of life and the energy of light within its structure that has resonated with the human spirit since the earliest man. Because of its preservation of life, Amber was revered as a repository of souls, and amulets of Amber were used in funeral rites for mourning the dead and placed in burial tombs with other treasures to protect the soul during its journey to the afterlife. Amber was considered to be a protective amulet for children, and Pliny records necklaces were made of these nuggets and hung about the neck of infants to keep them from the evil powers of witchcraft and sorcery. It was also thought to help with teething pain. An amber stone possesses an electromagnetic quality that can build up electrical charge, and this makes it an effective healing tool. Amber is used to stimulate metabolism and address any metabolic issues. It’s an effective treatment for allergies, especially those which affect the respiratory system. It can relieve headaches. It’s known to be helpful with rheumatoid arthritis and in easing the pains in the ligaments and joints as well. It can energize the endocrine system and enhance the heart muscles. It’s also beneficial in tissue revitalization. Amber can heal the glandular system and help with DNA-related problems. It’s known to cleanse the blood and help move energies in the body. This stone can effectively draw illnesses out of the stomach, liver, and the spleen. Amber has also been credited to help in curing impotence and female infertility. Amber is a stone of manifestation. It’s a powerful stone that can manifest an increase in your income flow or other forms of wealth. This stone will inspire you to make use of your gifts and talents to bring wealth and abundance in your life. It will dissolve any feelings of insecurity or uncertainty and fill you with energies of determination and inspiration. This stone will also promote good luck and success! It will remove the opposition and make sure that it’s all systems go for you. Amber will eliminate your fears and apprehensions. It will give you the courage to try something new, to break away from the mold, and to take calculated risks that will yield prosperous rewards. When it comes to love and relationships, Amber can be a very powerful and beneficial stone. It will help you develop more patience and understanding towards the person you love. You will not easily lose your temper or get annoyed when you are infused with the energies of this stone. Amber will bring stability to your relationship. It will promote flexibility and patience, and it will bring more trust and happiness. You will be a calmer and more tolerant partner. You will get rid of your childish ways and be more mature about the important issues that concern you and your relationship. Amber will also protect your relationship against outside negative influences or interferences. It will strengthen your relationship from within so that it will not easily fall apart at the first sign of trouble. This stone will remove the negative energies that are taking away your enthusiasm and optimism, as well as the negative energies affecting your drive for life. It will get rid of your jealousies and insecurities. It will remove the fear and the lack of trust. This stone will also give you more wisdom to accept the things that happen to you which you have no control over. Amber will give you the foresight to deal with unexpected events and to react to them appropriately. This stone is a symbol of beauty and attraction. When you have this stone in your life, you will have a better appreciation of all things beautiful, and you will be very attractive to the eyes of your partner! It carries energies of tenderness and affection. This stone will imbue your relationship with many tender and affectionate moments with your loved one. This stone will also attract lasting love. It doesn’t matter if you’re going through a lull or a tough time in your relationship. The energies of Amber will work on your relationship so that love will be restored and happiness will be felt again. Amber will help you remove the obstacles that you place in your way that keep you from being loved in the way that you want. It will make you realize that the walls must come down if you truly want to have a wonderful experience with love! You need to open the door to your heart if you really want to know the meaning of love! Amber is a stone that will help you keep your promises. Its energies will also help you rekindle the fire in a dying relationship. The energies of the Amber stone will also electrify your desire, and you can enjoy passionate and intimate moments with your partner. Amber should be cleansed when it begins to warm when held or worn. It may also start to get cloudy when it’s exposed to negative energy. Don’t place your Amber stone in direct heat, and it should never be left under the sun for too long because it will make the stone brittle. It will be beneficial to always bring a piece of Amber stone with you so that its healing energies will be close to your body. It will bring relief from many physical pains and afflictions, and it will hasten your recovery period when you fall sick or suffer an injury. If you will use Amber to purify or cleanse your space, you can place pieces of Amber stones in different parts of your house or your office. You can also spray it as an elixir or use it as an incense. Amber is a lovely stone and a powerful healer that will give whoever wears it a strong sense of healing. It’s one of the most coveted and oldest stones because it is basically created by light and life! Amber is a talisman of beauty and has been portrayed as solidified sunlight, as toughened honey, as tears of the gods, and as drops of the sun. It will help balance your emotions and release the negative energies that are in your heart and mind. It will also help you get rid of all the things that make you fearful and hesitant to live your best life!